Choose from a unique range of personalised wedding invitations designed to suit your wedding theme and personality. Whatever your taste, Bride and Groom Direct have it covered. Established for over 110 years, our team of specialist designers have hand-picked and designed hundreds of designs, styles and colours. From contemporary wedding invite designs, to rustic, vintage and everything in between, it's always good to know what the latest wedding theme trends are! Ribbons, Butterflies and Pockets are just examples of popular choices for 2019. The most important thing is to find the right wedding invitation design for you and your special day, browse our best sellers below for some inspiration. The most important thing is to find the right wedding invitation design for you and your big day. For some inspiration and to find the ideal design for you, head over to Bride & Groom Direct's dedicated wedding invitation section. At Bride & Groom, we are always looking to create new elegant wedding invitation designs, to guarantee that our customers are always spoilt for choice. Our newest items come in numerous styles, designs, and are available in both day and evening form, so you are sure to discover the ideal wedding invitation that suits both you and your partner. To explore our newest collection of wedding invitations, head over to our 2019 wedding invitations range. 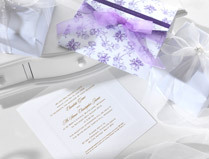 At Bride & Groom Direct we have an immense range of day and evening invitations for you to select from. Bride & Groom Direct share your aim to make you wedding day as perfect as possible, and one step towards achieving this goal is by looking at our themed wedding invitations. Inspire yourself and choose a theme that mirrors your wishes today. Furthermore, Bride & Groom Direct also offer a variety of different styles that can effectively display the personality of you and your partner. 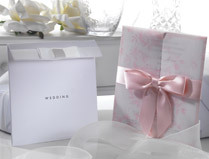 Whether you are seeking an elegant folded design, a romantic pocket invitation or the traditional flat style, you can be assured that your desired style will be right here at Bride & Groom Direct. 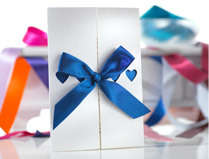 Are you after a specific colour to complete your dream wedding invitation? You name it, Bride & Groom Direct have got it. 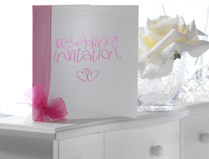 Our beautifully designed wedding invitations are available in a wide variety of colours. If you're seeking a vibrant combination of purple and pink colours, or seeking a more simple but equally effective black and white combination, our colourful collections section is certain to have the colour theme that your heart desires. For those of you who find the concept of unique, gorgeous, hand-crafted wedding invitations appealing, then look no further than Bride & Groom Direct's DIY Wedding Invitations. Our popular DIY Wedding Invitation range allows you to take control of the design of your wedding invitations, without having to deal with the hassle that comes with making your invitations by scratch. 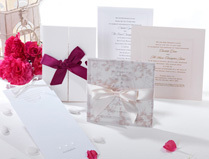 For more information on the beautiful selection of DIY Wedding Invitations that we offer at Bride & Groom Direct, look at our DIY Wedding Invitation section now. We understand that you don’t get married every day and won’t necessarily know the traditional wordings and templates which go on a wedding invitation. To make your purchase easier when you come to personalise our invitations they are all pre-populated with standard templates so you can have comfort that your invites are in line with modern etiquette. For further tips on wordings please look at our guide to wedding wording styles. Sometimes you just need to see and feel something in the flesh, we totally get it. Your wedding is the most important day of your life and most brides want to see every detail of their dream wedding ahead of the big event. 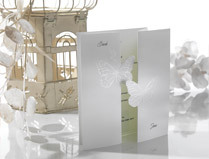 Any of our wedding invites can be requested as samples with no charge. Simply choose the 'request sample option' when viewing any of the invitations you're like to get a closer look at. All wedding invitations come with free envelopes too.